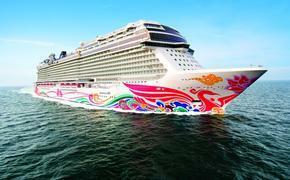 THE PULSE: Holland America Line Issues renderings of new ship due in 2016. When Holland America Line welcomes ms Koningsdam to the fleet in February 2016, the ship will debut a new era in design approach for the line. As the first ship in the Pinnacle class, the 2,650-guest ship will have an interior that blends a fresh, contemporary styling in perfect harmony with the line’s renowned classic elegance. Future guests, travel agents and ship fans can now get the first look at select interior renderings on Holland America Line’s website, www.hollandamerica.com. The story of the ship will unfold online over the coming months through vibrant renderings, engaging videos, ship facts and more details about the interiors created by Adam D. Tihany and Bjørn Storbraaten. At the helm of the interior conceptualization is Tihany, regarded as one of the world’s pre-eminent hospitality designers. A leader in creating luxurious and creative interiors at some of the world’s most iconic properties, Tihany has approached ms Koningsdam with an eye toward creating public spaces that reflect the tradition and signature elegance for which Holland America Line is known, while elevating the design to strike a more modern balance of past, present and future. 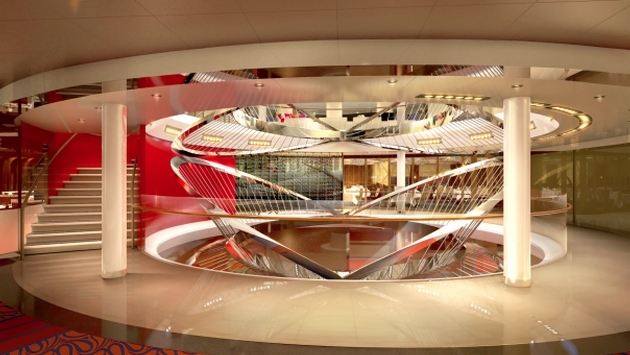 For example, at the heart of the ship Tihany is creating visual drama with the central atrium. Soaring three decks high, the space is graced by an airy stainless-steel sculpture that represents the synthesis of a string quartet. Like music, the experience changes as guests move around and through it, so no two perspectives are the same. The atrium is capped by a ceiling “skylight” that serves as a backdrop for subtly changing high-definition projections. Guests will look up by day and see wispy cirrus clouds floating in an azure sky or perhaps soothing images of light in water. By evening, the atrium takes on dramatic lighting hues or reflects the starlit constellations of the night sky. The iconic Queen’s Lounge has been completely reimagined as an elegant theater and entertainment venue that spans two floors. Tihany once again drew inspiration for the space from music, nodding to the sensual curves of a violin and featuring extensive use of wood, fluid waveforms and light. With state-of-the-art technology, the Queen’s Lounge will showcase world-class musicians and the largest dance floor on the ship. Architect and designer Bjørn Storbraaten joins Tihany in bringing the ship to life in a familiar yet innovative style. With his previous work on ms Eurodam and ms Nieuw Amsterdam, Storbraaten adds continuity of the brand to ms Koningsdam, while taking elegance to the next level. Storbraaten’s hand is clearly present in the design of the central pool area. The Magrodome, which typically is a single level on Holland America Line ships, has been expanded to two levels to create a vast glass-enclosed space. The lower level will have more traditional poolside elements, while the mezzanine level will be a new concept for the brand. In addition to other areas, Storbraaten is designing the exotic look of Tamarind, the line’s Pan-Asian restaurant that emphasizes nature’s basic elements: water, wood, fire and earth. Across the ship, Tihany and Storbraaten are working together to make ms Koningsdam an evolution of the Holland America Line brand. For more information about ms Koningsdam and Holland America Line, consult a professional travel agent, call 1-877-SAIL HAL (877-724-5425) or visit www.hollandamerica.com.